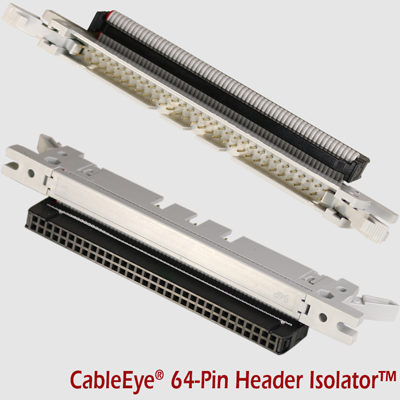 CAMI Research Inc. (Acton, MA) has released a new 64-pin Header Isolator™ for its CableEye automation-ready, cable and wire harness test systems. Recommended when there is a need for repeat connection and disconnection of test fixture cables, it allows users to minimize bent pins and wear of the headers on the main unit, expansion modules, and free-standing QuickMount™ housings. The device may be used with any CableEye model and is rated to 500 Vdc/ac. A leader in development of PC-based cable and wire harness, continuity, resistance and hipot test systems for over 20 years, CAMI offers the CableEye suite of products complete with accessories – including plug-in connector boards. The selection of these test fixture boards is constantly growing and is currently numbering over 60 – most of which are populated with families of connectors. When pre-populated boards are used, the tester GUI automatically displays a graphic of the connectors under test. The tester can be programmed to do the same for custom boards and fixtures. For wire/cable test interface connections only, this new device attaches to any tester header in the same quick and easy way as CAMI connector boards. The CB25A solution (Item 755A, rated to 500 Vdc/ac), which attaches to headers only on the main unit or QuickMount housings, can be used with either wires/cables or CAMI connector boards. For higher test voltages (up to 1500 Vdc/1000 Vac) we offer Item 778A for base unit (i.e. top deck) and QuickMount headers and Item 778B for expansion module headers. Connector isolators are included in CableEye’s standard, renewable one-year warranty of the tester for which they are purchased. Available immediately, the header isolator is sold as a set of two for $38 (Item 868). Test fixture cables are not included. Contact sales@camiresearch.com or +1 (978) 266-2655 for a quote. Note: Prices are USA only and subject to exchange rates, freight and import costs. Contact your local authorized distributor for local pricing.